Will Robertson of the Washington Bicycle Club rides an American Star Bicycle down the steps of the United States Capitol in 1885. The American Star Bicycle was invented in 1880 by G. W. Pressey and manufactured by the H. B. Smith Machine Company in Smithville, Burlington County, New Jersey. It was characterized by a small wheel in front to avoid the problem of tipping forward inherent in other high wheelers. A Star bicycle was photographed being ridden down the steps in front of the United States Capitol in 1885 to demonstrate its longitudinal stability, and Star bicycles were used for the sport of bicycle polo in the mid-1880s. Pressey sued Smith in 1887 for royalties. The name "Star" was attributed to the double star arrangement of the spokes. The small front wheel, 18–23 inches (46–58 cm) in diameter, steered, and the large rear wheel, 42–60 inches (110–150 cm) in diameter, provided the forward driving force and bore most of the rider's weight. The light load on the front wheel was reported to have made it skittish on loose surfaces such as sand and gravel. American Stars incorporated pneumatic tires very soon after they were developed, and braking was provided by a spoon brake acting on the rear wheel and actuated by a lever on the right handlebar. A pair of independent treadle mechanisms collected power from the rider's legs instead of a crank. Power from each treadle was transferred to the rear wheel by a leather strap over a ratchet mechanism. (See image in gallery below.) The attachment point of the leather strap could be moved to provide multiple gear ratios, and both treadles could be pressed simultaneously for a brief increase in torque. A spring attached to the ratchet rewound the strap when the foot was raised. This treadle arrangement also allowed riders of different sizes to ride the same bike comfortably without modification, as the pedals were not constrained to trace a circle about an axle. An undated advertisement lists prices from $75 to $120, depending on wheel size and finish, which varied from "plainly finished machine; painted and striped" to "all nickled [sic] and polished, except the rim, which is painted and striped in gold." Smith also offered tricycles in 1887 and 1888 and patented a steam tricycle in 1889. 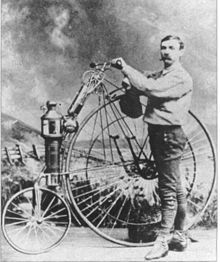 At the first Maricopa County Fair in 1884, Lucius Copeland demonstrated his steam bicycle, one of the first motorcycles, a steam-powered Star high-wheeler. It was claimed to have traveled 1 mile (1.6 km) in 4 minutes, at a steam pressure of 80 pounds per square inch (5.5 bar), and carried enough water and fuel to run for an hour. "American Star" was also a brand name used by a Japanese bicycle manufacturer in the 1960s and 1970s. The Smith Machine Co. commissioned several musical compositions to promote the American Star Bicycle. In 1882, Chas. W. Nathan composed the Star Bicycle Gallop for piano, and in 1883, John Ford composed The Star Rider. Song & Chorus for piano and voice, which was provided on the back cover of advertisements for American Star Bicycles. ^ a b c d e "The American Star". Library of Congress. Archived from the original on 2012-12-13. Retrieved 2012-01-16. ^ a b "ca. 1885 American Star Safety Highwheeler". Owls Head Transportation Museum. Archived from the original on 2012-05-25. Retrieved 2012-01-16. ^ Herlihy, David V. (2004). Bicycle, The History. Yale University Press. p. 235. ISBN 0-300-10418-9. ^ Herlihy, David V. (2004). Bicycle, The History. Yale University Press. p. 219. ISBN 0-300-10418-9. ^ "A Star Bicycle Suit" (PDF). The New York Times. June 4, 1887. Retrieved 2012-01-16. ^ a b "American Star bicycle, 1885–1890". Powerhouse Museum, Sydney, Australia. Retrieved 2012-01-16. ^ "Smith Pony Star bicycle". National Museum of American History. Retrieved 2012-01-16. ^ "Smith Star bicycle". National Museum of American History. Retrieved 2012-01-16. ^ "Smith tricycle". National Museum of American History. Retrieved 2012-01-16. ^ Bob Shaver. "H. B. Smith Steam Tricycle". Bicycle Technology and Patents. ^ Frank J. Dykas (July 23, 2007). "H. B. Smith Steam Tricycle". Patents and the History of Technology. Retrieved 2012-01-17. ^ "First motorcycles: Copeland Steam Powered Special". 26 May 2011. Retrieved 2012-01-17. ^ Gagan, Peter. "Earliest Steam Cycles". stanleysteamers.com. Retrieved 2012-01-17. ^ Douglas Self (1 Aug 2011). "Steambikes!". The Museum of Retro Technology. Retrieved 2012-01-17. ^ Murray Barnard (1996). "The Copeland Steamer". The A-Z of Motorcycles. Retrieved 2012-01-17. ^ Howie Cohen. "American Star Bicycle". Everything Bicycles. Retrieved 2012-01-16. ^ "Sinclair Jerseyana Collection". Rutgers University Libraries. Retrieved 2012-01-19. ^ "Star Bicycle Gallop". The Lester S. Levy Collection of Sheet Music in the Sheridan Libraries at Johns Hopkins University. Retrieved 2012-01-19. ^ "The Star Rider. Song & Chorus". The Lester S. Levy Collection of Sheet Music in the Sheridan Libraries at Johns Hopkins University. Retrieved 2012-01-19. Wikimedia Commons has media related to American Star Bicycles. This page was last edited on 15 November 2018, at 06:16 (UTC).